Between spiky Thors and scary Predators, there’s been quite a few reveals for Square-Enix’s Play Arts Kai line recently — but that’s not stopped them from lifting the lid on their latest Star Wars toy today. Although this Darth Maul isn’t as wacky as Play Arts Kai at it’s best, it looks absolutely awesome. Play Arts Kai’s first Prequels-era figure (and fourth villain — when are we going to get some good guys? ), Maul’s look is similar to the company’s take on Darth Vader. Nothing radical, but some extra armour pads in between the stylistically swooshy robess he usually wears give the figure a clean and relatively lean look. You’d think Maul would’ve had some extra waist protection so he can avoid being bisected by a certain Jedi! But either way, it’s a pretty slick update to the character’s look that doesn’t go too far into shaking things up beyond recognition. Apart from his swooshy robes the 10” tall Maul figure comes with a stand, the usual additional hands to hold things, and three lightsabers: his usual double-bladed one and a version split in half, so he can dual wield them and look suitably cool while doing so. He also has two heads: one maniacally grinning, and one more emotionless. I really do like how dynamic the robes look, even when in a relatively neutral pose. It makes an otherwise plain figure look rather dramatic! 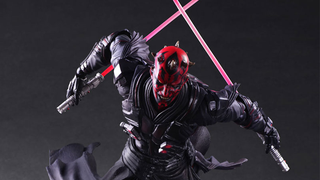 Variant Darth Maul will be available in August in Japan, for 13,000 Yen — around $100.